Published: Feb. 25, 2013 at 06:07 p.m. 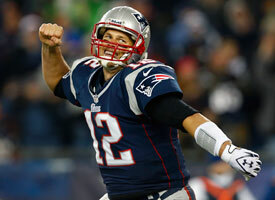 Updated: Feb. 26, 2013 at 01:30 p.m.
Tom Brady's three-year, $27 million contract extension is fascinating on so many levels. It helps the New England Patriots compete in the free-agent market for the next two years. It truly makes Brady a Patriot for life. Take a look at the best photos of Tom Brady. But let's not pretend that Brady doesn't get something out of the contract. NFL.com's Ian Rapoport and Albert Breer both report that all of Brady's contract is guaranteed. That's $60 million. That's guaranteed money until Brady is 40 years old, an awfully rare feat in football. The devil always is in the details with these contracts. An agreement with $60 million guaranteed would rival the deal of New Orleans Saints quarterback Drew Brees, even as Brady helps the Patriots' cap situation. There are so many angles here, let's break this baby out into a list. 1. Let's not pretend this matters to Joe Flacco's negotiations with the Baltimore Ravens. Everything about his contract situation is different, starting with his age and free-agent status. Brady's contract might make some quarterbacks look bad publicly, but it doesn't wipe away the mega contracts for Peyton Manning and Drew Brees. (Or even Brady's last contract.) Flacco is going to make his money. "There's no impact whatsoever on what we're doing," Joe Linta, Flacco's agent, told USA Today Sports. "It doesn't matter. It's an extension for cap purposes. And we don't know all the details at this point. "The bottom line is, whether Brady took a pay cut or took $27 million a year, it wouldn't have an impact on what we're doing. We've determined a number that we think is fair with respect for the Ravens' cap situation." 2. The deal clears about $15 million in cap space over the next two years, according to Breer and Rapoport. The Patriots look at everything in two-year windows. They now have more than $20 million in cap room to spend in 2013. Yes, that should help them try to keep wide receiver Wes Welker and right tackle Sebastian Vollmer. My guess: The Patriots still value Welker more than any other team out there. 3. A lot can happen in five years. Brady knows it as well as anyone. Breer reports that Brady was concerned about his contract becoming an albatross for the team as he turned 38 or 39 years old, a la Brett Favre. This deal truly gives Brady a chance to never leave the Patriots. And he helps the Patriots avoid having to cut players over the next two years. 4. This move certainly will play well in public and in the locker room. "Hearing the news about Tom is a reminder of why he is the definition of a team player," Patriots cornerback Devin McCourty wrote on Twitter. A contract this big involves give and take for both sides. Brady might have given up some long-term money, but he gets a ton of guaranteed money and a whole lot of respect.